This day...May 17th...has been on my mind for months. It is a BIG day. The most important thing about May 17th is that it is my Daddy's birthday! My Daddy is the best. Happy Birthday Papa Texarkana!! We love you!!! Obviously, priorities had to be set today. My first and foremost priority today was Jonah's court hearing at 8:00 a.m. My sweet hubby offered to call in late to work so he could take Hillary Ashton to school and the three little kiddos to MDO for me so I could be at court at 8:00 a.m.
My hope was to be in and out of court quickly so I could make Jonah's doctor visit this morning as well. It is actually pretty tough to coordinate his doctor's visits around the Monday MDO time, so I really hoped we would be able to make it today rather than have to reschedule. I realized the idea of getting in and out of court quickly was optimistic, but since we were on the schedule for 8:00 a.m. I thought there was a really good chance. I mean how far behind could they be first thing in the morning? Hahahahahahahahaha! Swim lessons were off the table for table for today...just wasn't gonna happen. So, I thought I had a good idea of how my day would go today...let's see how it played out. 7:10 a.m. - Left the house on time...yipeee! 8:04 a.m. - Hit a little traffic on the way to court, but still was the third person in the waiting area :o) Looking good! 10:00 a.m. - Lady beside me projectile vomited all over the place...ewww! Vomit reminds me of the doctor's visit...not gonna make it today. Called and got Jonah's doctor visit rescheduled...there were NO appointments available on the remaining two MDOs I have to drop the kids off at before summer break. Shoot! Still waiting on our case. 11:00 a.m. - Rumors start circulating that there are a lot of juvenile delinquent cases from the weekend. All of those cases must be heard before the DHS cases are heard. 1:35 p.m. - Decide I can't wait another minute...I must leave to go pick up the little kids at MDO by 2:00 p.m.
1:36 p.m. - Bailiff enters the waiting room and calls, "J******* N***** (that's my baby's case)." 1:37 p.m. - Internal hissyfit by me. Ugggggg! Seriously???? I have been sitting in this disgusting waiting room in the middle of the hood for 5 1/2 hours and NOW, right when I am standing up to leave, they call my case!!!! !I missed swim lessons. I missed the doctor's visit. I am now missing court! Uggggg!!!! Whine, whine, whine!!!!!! 2:00 p.m. - Pick up sweet babies from MDO. Thankful I still have Jonah in my care. 2:20 p.m. - Check Hillary Ashton out early from school...I have had enough waiting around for today. 2:30 p.m. - On the way back to the car, I see my good friend from church. My friend: "Hey Amy. Where were you guys last night??" I am completely clueless. Completely. Blank stare...think, think, think. I have nothing. Me: "What was last night?" My friend: "The preschool choir concert." Remember the preschool choir concert? 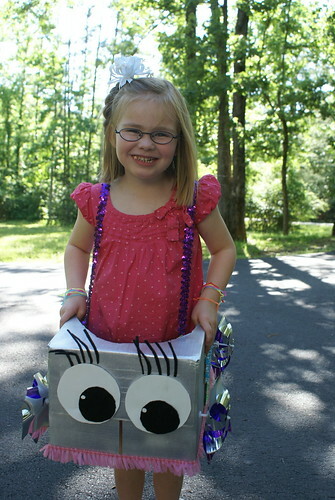 We made the car out of a cardboard box for the show on Day 124. We have had TWO dress rehearsals for this concert. Not only is my child a participate in said concert...I am one of the two preschool helpers for the PK4 choir...Yep, that concert. I completely and totally forgot. Uggggggggg! Is this Day over yet? Wow what a bummer. So sorry. Put the kids to bed and watch a movie tonight! what happens next? A new court date for Jonah? Tough day. Give those kids a big hug and you'll feel much better! How do you find out what happened in court? Oh dear...so sorry you have had such a rough day! If you aren't already in bed, I suggest pj's, a good book, and a glass of wine! :) Hope tomorrow is better! Wow, Amy--what a crazy day. I wish I could have helped you!!! I would have gone to get your kids at MDO or something--you can call me any time! So I'm wondering too what happens with Jonah now with court? I was thinking about him today. Those days where I have to think through the schedule minute by minute to see if I can get everyone dressed/ready and from one place to the next really stress me out. I hope you had a relaxing evening to recover from a crazy day. While I know you were very frustrated, you handled that so well! I would have been less than kind to anyone who came my way after all of that. I do hope your day ended on a better note! Praying for the baby in hopes that all will go well for him and that your hearts will be at peace!